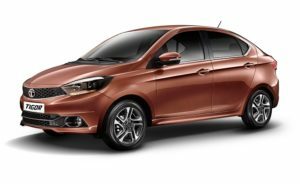 Right from the start, Tata Motors had planned to make a sedan on the Tiago hatch as well. No surprises then that the two cars share a lot, on the surface and under it. Viewed right from the front the Tigor looks just like the Tiago, but subtle tweaks mark this out as the richer package.There is a black surround for the headlamps, which feature a double-barreled layout and projector lamps too. The grille also gets a new hexagonal pattern.The changes start in earnest as you view it from the side. The Tata Tigor is longer than the Tiago by 246mm and part of this is down to the wheelbase having been stretched by a massive 50mm. At 2450mm, the wheelbase is longer than a Maruti Swift Dzire. This increase in wheelbase and the larger rear doors have made the Tigor a proper redesign.The roof arcs down into the stubby, high-set boot. The hexagonal pattern can be seen in the slim, split tail lamps too. There is a smart fused LED strip at the bottom of the unit and the way the chrome strip that runs along the boot lid flows into the lamps is cool too.The stance seems to be of a car on the move as the shoulder line inclines from the high-set boot down into the front headlamps. While 15-inch rims on the petrol variant (up from 14-inchers on the Tiago) look handsome, we feel wider tyres and 16” rims would have given it an even better stance. Step inside the Tigor and you are reminded that this one is based on the Tiago as the cabin layout and design is shared by both the offerings. Now what’s unique about the Tigor is that it gets a mild colour revision with a tad darker shades on the trims. The signature steering wheel has been carried over, but it gets piano-finished detailing instead of the satin finish. While the design of the cabin feels modern, the quality of plastics isn’t appealing enough especially when you compare it with Hyundai. Here is where it needs substantial improvement. The Harman-developed infotainment system has been updated for the Tigor as it is now a touchscreen unit that doubles up as the screen for the rear parking camera. It also features emergency assist, service reminder and navigation which is projected on the screen by connecting an Android phone with the help of USB. All of these functions and few more can be accessed with the help of Android apps only thereby leaving no option for iOS users. We asked the company officials on when can we expect to see modern infotainment connectivity options and were told “very soon”. The Nexon perhaps? The most impressive bit about the Tigor’s features has to be its music system, as has been the case with all the newer offerings from Tata Motors.